Soon after being employed by the Firefighters’ Association in 2014, this writer discovered at the State Archives a Petition of Incorporation for “The S. C. Volunteer Firemen’s Association”, dated June 6, 1898. It is petitioned by eleven (11) individuals, all fire service leaders residing mainly in Greenville and Orangeburg, with one each from Florence and Winnsboro. The petition is signed by D. H. Tompkins, Secretary of State. The immediate question which came to my mind was “what happened to this new Association?” We know that our current S. C. State Firemen’s Association was established in 1905 by an entirely different group of individuals just eight years after the “mystery” Association’s incorporation. Well, it has taken me three years of research to have possibly discovered the answers to this lingering question. However, to adequately tell the whole story, we need to go back in time to those early years of the mid-1800s. As fire departments were formed throughout the villages, small towns and cities of South Carolina to fight the increasing number of devastating fires, the firemen of that time found ways of channeling their energies between alarms of fire by competing locally and regionally in tournaments, public demonstrations and grand parades. In the June 14, 1888, edition of The Anderson Intelligencer, the Firemen’s Tournament is described as “a grand success” with thousands of visitors. The commentary says that “Anderson is alive with firemen and visitors…the grandest demonstration that has ever occurred in our prosperous little city.” It further states that Anderson’s firemen are determined “to make it one of the grandest firemen’s demonstrations that has ever occurred in the State.” It is noted that fire companies from Augusta and Athens, Georgia, made the trip to Anderson to participate in the competitions, and even Governor John Peter Richardson attended the festivities. There is no shortage of documentation and records providing accounts of the important role of firemen’s tournaments in the evolution of South Carolina’s fire service and to the prosperity of individual communities. So, let’s get back to the 1898 incorporation of The South Carolina Volunteer Firemen’s Association. The Times and Democrat (Orangeburg) reports in the November 10, 1897, edition that the Board of Fire Masters attended a convention In Greenville for the purpose of organizing a State Firemen’s Association. The article says the delegation from the Orangeburg Fire Department was the largest in attendance outside of that from Greenville. The piece goes on to report that “the matter of securing a charter and an appropriation for the volunteer firemen of the State from our next legislature was assigned to the solicitor of the East End Reel Company.” Interestingly, the decision was made to hold the next annual meeting in Orangeburg in August of 1898. Between November of 1897 and August of 1898, a group of fire service leaders petitioned the Secretary of State to seek incorporation for the South Carolina Volunteer Firemen’s Association. The “Board of Corporators” was made up of the following chiefs and officers: J. O. Cauble (Chief of Greenville), Daniel E. Dukes (Chief of Orangeburg), L. H. Peebles (Greenville), B. J. Quattlebaum (Winnsboro), J. P. Haynes (Greenville), Samuel A. Dukes (Assistant Chief of Orangeburg), Charles A. Buchheit (Chief of Florence), L. M. Sullivan (Greenville), W. F. Martin (Assistant Chief of Greenville), William Goldsmith (Greenville), and I. W. Bowman (Orangeburg). What happened to this newly incorporated “volunteer” association? No mention has ever been made of this organization since the second convention was held in Orangeburg in November of 1898. This writer thinks the answers of why this association faded away may have been found by looking at the status of the founding members, the limitations of membership, and an unsuccessful attempt to obtain any permanent underwriting. At the time of incorporation, most, if not all, of those chiefs and chief officers were volunteer firemen due to the fact that their departments had not yet become paid departments. However, in the early 1900s, several of these founding leaders became paid fireman in their respective departments and were no longer considered volunteer members. Additionally, membership in this association was apparently restricted just to the volunteer service. And, lastly, there is no record of the Association pursuing a permanent funding source from the legislature as originally desired. Without groomed or seasoned leaders to take positions of authority, the volunteer association likely withered on the vine for a short time until Charleston’s Chief Louis Behrens took up the cause and proposed that another Association should be more appropriately organized which would represent all firemen, volunteer as well as paid. Now, we just may have the rest of the story. In May of 1905, a group of fire service leaders representing both volunteer and career firemen met in Columbia to form the South Carolina State Firemen’s Association. Chief Louis Behrens of the Charleston Fire Department was elected the first president and served for twenty-seven (27) years in that position. 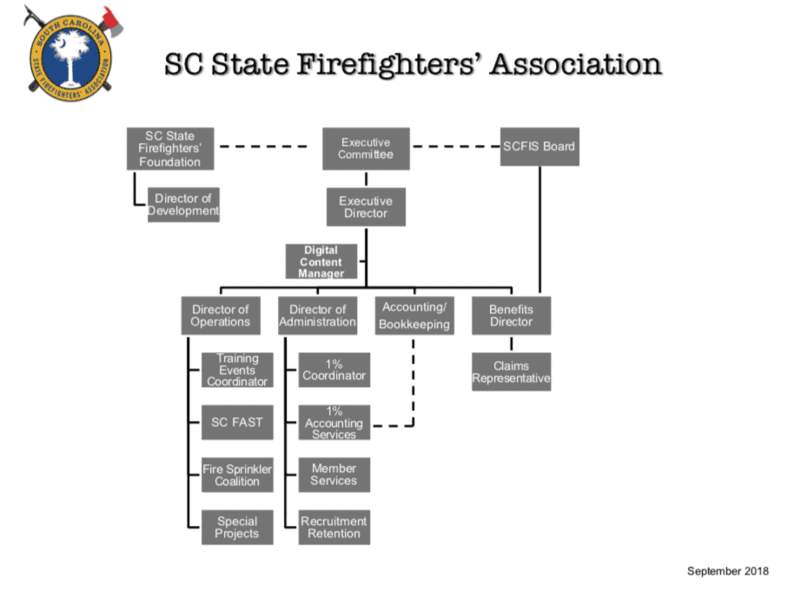 And, in 1910, the Legislature of South Carolina passed a law creating a fund for fire departments derived from a tax on insurance premiums of which 5% of those proceeds were assigned to the State Association for benefits and operational expenses. In closing, much credit must be given to those early volunteer firemen who crafted a vision for the fire service and tried to get solid footing as a viable statewide organization. However, time charted another more effective and all-inclusive course designed to benefit all of our State’s firemen, volunteer and career. Truly we are the beneficiaries of the vision and toil of those pioneers which now allows us the privilege to share in that “Brotherhood Like No Other”.